The traditional Slavic festival of Maslenitsa is a favorite time of year for Russians all over the world, and the festival is widely celebrated in many countries. But what happens in Russia itself during this “Butter Week”? Maslenitsa is a time-honored Russian festival, and its origins, of course, are pagan. When the Orthodox faith arrived in the ancient state of Rus, “Maslenitsa” (“Butter Week,” or “Pancake Week”), like other festivals, became an intrinsic part of the church’s calendar of festivals. Aside from anything else, it is part of the preparations for Lent — that most difficult time when people are supposed to abstain from all animal-derived foods, as well as alcohol, bad language and bad thoughts in general. 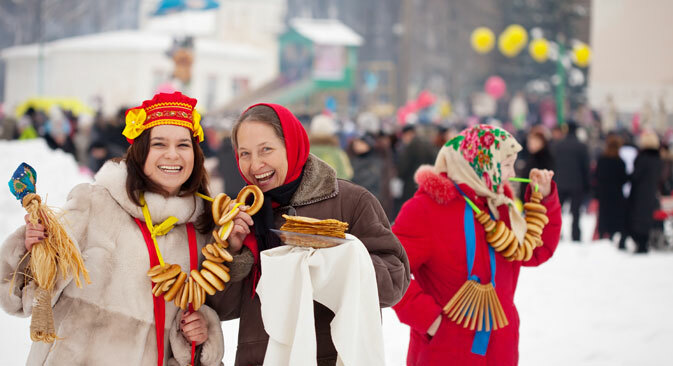 The first day of Maslenitsa is customarily known as “Meeting Maslenitsa.” In Moscow, the pancake week begins at 5 p.m. on Monday, right in the center of the city (at Vasilyevsky Slope on Red Square). This is where you can — and must — have a good time until late in the evening, eating pancakes with all kinds of fillings (some sweet, others less so), dancing to music groups and, of course, keeping yourself warm by drinking tea. Be prepared for temperatures of minus 10 degrees Celsius (around 14 degrees Fahrenheit). There are Maslenitsa events on Red Square every day, so if you’re not sure where to go, head for the heart of Moscow and you won’t go wrong. The second day of Maslenitsa is a day for young people. From time immemorial, the custom has been to celebrate and have a good time all through the week — but especially on this day! In the old days, young lads and lasses would go sliding down snowy slopes or sledding. Of course, they would eat pancakes too. Even today, this kind of simple pleasure is undeniable. The Tsaritsyno estate in Moscow (closest to Tsaritsyno metro station) welcomes anyone who wants to go for a winter walk. You can go sledding on inflatable snow tubes for 30 minutes to up to an hour, for 80 rubles ($2.50) or 150 rubles ($5), respectively. The third day of Maslenitsa is symbolically called “Sweet Day.” You can devote this day to a culinary tour of the capital. Every café and restaurant offers a special menu for Maslenitsa week, with every possible type of pancake you can imagine. Don’t deny yourself the pleasure of trying what at first sight might appear strange but is an entirely authentic dish — red caviar pancakes. Two streets — Kamergersky pereulok (closest to metro stations Okhotny Ryad and Teatralnaya) and Lavrushinsky pereulok (metro Tretyakovskaya) — are transformed into kitchens during Maslenitsa, and you can try exotic pancakes there all week. On “Revelry Thursday,” you have to do some serious eating, because Maslenitsa is followed by the Great Lent fast — and fasting lasts for a whole forty days until Easter. In ancient Rus, this was the time when the winter stocks were running out and people had to restrict their consumption of food. We suggest perhaps shedding unwanted pounds by skating in Gorky Park. It costs 300 rubles ($9) to get in, and the rental deposit for skates is 1,500 rubles ($50); but be prepared for some seriously long lines. The second most popular place to skate — Sokolniki Park — is a bit cheaper. You can also expect to see people taking part in Maslenitsa celebrations every day in these places. On the fifth day of Maslenitsa, mothers — and especially mothers-in-law — traditionally go out for a stroll. Husbands are visited by their wives’ mothers, while young lads meet the mothers of girls they went sledding with on Tuesday — by the end of Lent, some of these young couples might even be married. If you haven’t managed to find a betrothed, take a walk through Moscow’s parks, which carefully put together programs of Maslenitsa festivities: Izmaylovsky Park (Izmaylovsky Park metro station), Krasnaya Presnya Park (Krasnopresnenskaya or Barrikadnaya metro stations), Hermitage Park (Okhotny Ryad or Teatralnaya metro stations), Tagansky, Kuzminki, Babushkinsky, Severnoye Tushino and Fili parks, and also the Bauman Garden (Taganskaya metro station) and Muzeon Park. The Maslenitsa celebrations are even grander in scale during the weekend. In Kolomenskoye Park you can go for a ride on a horse-drawn sleigh and take the “Russian Winter” trip (advance booking required, tel. +7 (499) 615-27-68; trip available until Mar. 24). The park traditionally puts on a lot of attractions for children, which makes it a real treat for a family day out in the winter. Sunday is perhaps the most important and dramatic day of Maslenitsa. This day is called Shrove Sunday. After eating pancakes to their hearts’ content and wearing down the soles of their shoes from walking all week, people ask each other’s forgiveness for absolutely everything, even if they haven’t offended anyone in any way. It is a day of unity and joy. The climax of Maslenitsa — as it is essentially a series of festivities to mark the passing of winter — is “Wide Maslenitsa,” when the effigy of Maslenitsa (a large figure made of straw) is burned. The severe cold weather is meant to depart with the smoke from this fire. This is a way to mark the coming of spring. The Maslenitsa effigy is burned in beautiful and extensive ceremonies in Red Square and almost all parks.